Beyond the political agreements signed during Mirziyoyev's visit to Dushanbe, there was also much talk of money. The president of Uzbekistan was due to fly out of Tajikistan around midday on March 10 at the end of a two-day state visit. That plan was changed at the last minute though. Shavkat Mirziyoyev remained at the Tajik presidential dacha in the winding Varzob Gorge well into the afternoon. Only once the presidential cortege made its way back to Dushanbe airport did police finally lift their lockdown on the city’s roads and allow traffic to resume its normal flow. 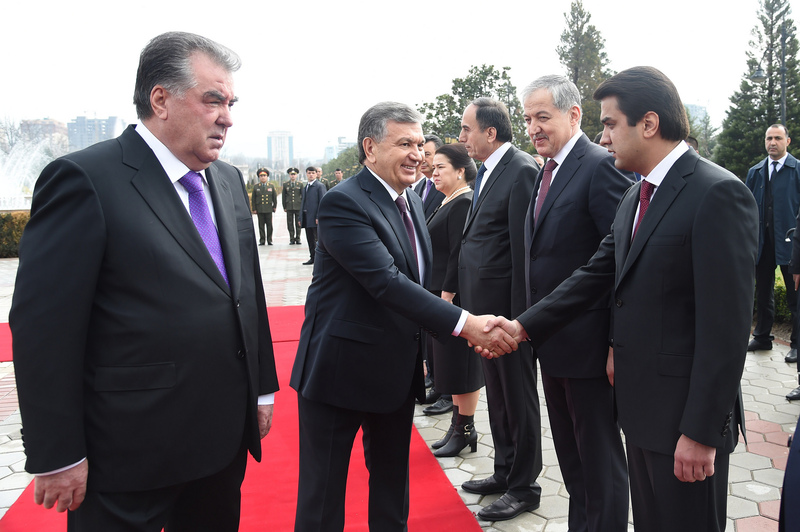 Motorists may have been disgruntled, but Mirziyoyev seems to have enjoyed himself. The leaders of these two nations have rarely relished one another’s company so much. Tajik President Emomali Rahmon once bragged to reporters about the times he got into fisticuffs with Mirziyoyev’s late predecessor, Islam Karimov. That history makes this sudden outbreak of bonhomie all the more remarkable. “The strengthening of friendship between our nations should serve as tribute to the memory of our forebears and the foundation of a peaceful and happy life for our descendants,” Rahmon declaimed in typically flowery manner. State television broadcast scenes from Mirziyoyev’s visit on an interminable loop long after the guest had departed. Tajikistan and Uzbekistan have been engaged in something of an undeclared cold war for the best part of two decades. Matters got truly bad starting around 2009, as Uzbekistan began imposing an inexorable series of embargoes. Trains stopped running, electricity supplies were cut and border crossings were sealed. Tajikistan had little with which to respond, so it sought to resume active building work on its giant Roghun hydropower dam over Tashkent’s intemperate objections. As Mirziyoyev’s visit was looming, it became clear all this was coming to an end. Crossings have been reopened and one-month visits between the countries were set to become visa-free. A train line joining the countries’ southernmost regions has resumed transporting cargo. Tajikistan has pledged to sell electricity to its downstream neighbor. Mirziyoyev even definitively signaled the end to his government’s opposition to Roghun, going so far as to suggest Uzbekistan might help with the work. “Mirziyoyev’s visit to Tajikistan is historic, mainly for the simple reason that since we gained independence, this is the first ever event to generate such a sense of optimism, particularly among the general public,” said Rakhmatillo Zoirov, a Tajik opposition politician rarely given to praising his own government. Beyond the many political agreements — which also included one of forming a working group to de-mine the entirety of the 1,300-kilometer border and another on deepening military cooperation — there was also much talk of money. Uzbekistan’s presidential administration announced that $143 million worth of trade deals were signed during a maiden bilateral business forum in Dushanbe. A repeat event is planned for Tashkent later this year. Uzbek banks will extend $100 million in credits to domestic companies exporting to Tajikistan. Uzbekistan has a considerable array of goods it wants to send across the border, from textiles, food and electrical goods to automotive products, building materials and chemicals. Residents of Tajik towns and villages near the border are already gleefully reporting the result of cheaper Uzbek imports arriving since several border crossings reopened earlier in the month. Eggs and flour sell in frontier towns at about half the price charged in the capital, Dushanbe. Rahmon declared optimistically that the volume of annual bilateral trade would “soon” reach $1 billion, a stunning projected increase from the $126 million recorded in 2017. Dushanbe-based political analyst Abdugani Mamadazimov said the economic benefits would mainly be garnered by Uzbekistan, however. “They will find an additional market on which to sell. Shavkat Mirziyoyev after all spoke only about exports. The late President Islam Karimov deemed Tajikistan a small market and thought that we were a poor country. But Mirziyoyev understands that while there is poverty in Tajikistan, it is not absolute poverty,” Mamadazimov told Eurasianet. Seen in the broader picture, this diplomatic embrace marks another forward step in Central Asian connectivity inconceivable under the arch-isolationist Karimov. Champions of this trend argue that integration will enable the region’s countries to better pursue their ambitions to develop and diversify their economies. The main game in town on this front has been the Moscow-led Eurasian Economic Union, which includes sometimes fractious neighbors Kazakhstan and Kyrgyzstan among its Central Asian members. Tajikistan and Uzbekistan have resisted Russian overtures to join the club, whose fortunes to date have been less than impressive. Following years of disaccord on collective electricity usage, Tajikistan will from April through to September export 1.5 billion kilowatt hours of power to Uzbekistan. The expectation is that Uzbekistan may return the favor in winter, when Tajikistan traditionally suffers from electricity shortages. Turkmenistan has been thwarted in its desire to send power to Tajikistan until now because of Uzbekistan’s unwillingness to provide transit, but that intransigence now looks to be over. Mirziyoyev’s visit to Tajikistan offered additional intriguing if more parochial political insights. 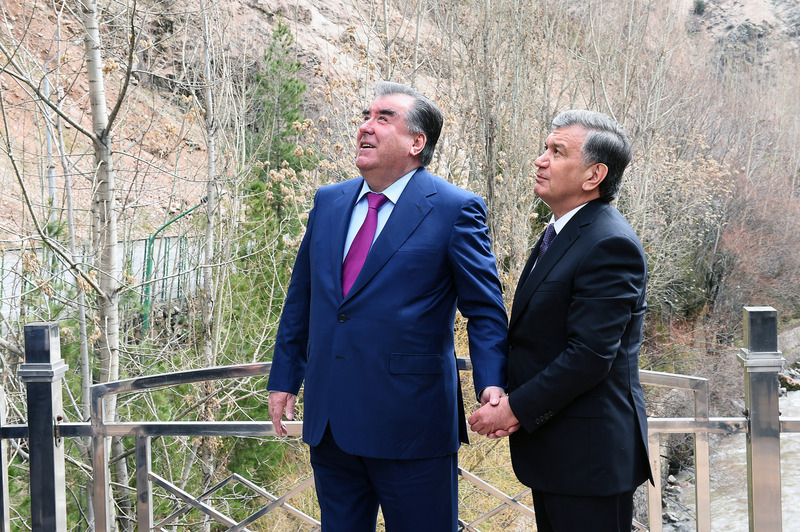 As analyst Mamadazimov noted, the Uzbek leader visited Tajikistan last in his regional goodwill tour — over the past 15 months Mirziyoyev has visited all the other Central Asia nations. Before his firing in January, Inoyatov had acted as head of the notorious security services since the mid-1990s. He was long assumed to be the power behind Karimov’s throne, a role he likely intended to continue under Mirziyoyev, who assumed the presidency in 2016. It was a telling detail that Mirziyoyev made his trip to Tajikistan on an Uzbekistan Airlines passenger plane. He had earlier been using a private jet reportedly rented from Uzbek-born Russian billionaire Alisher Usmanov. The decision to ditch the jet may be a sign of Mirziyoyev’s mounting confidence that a palace coup is off the cards.